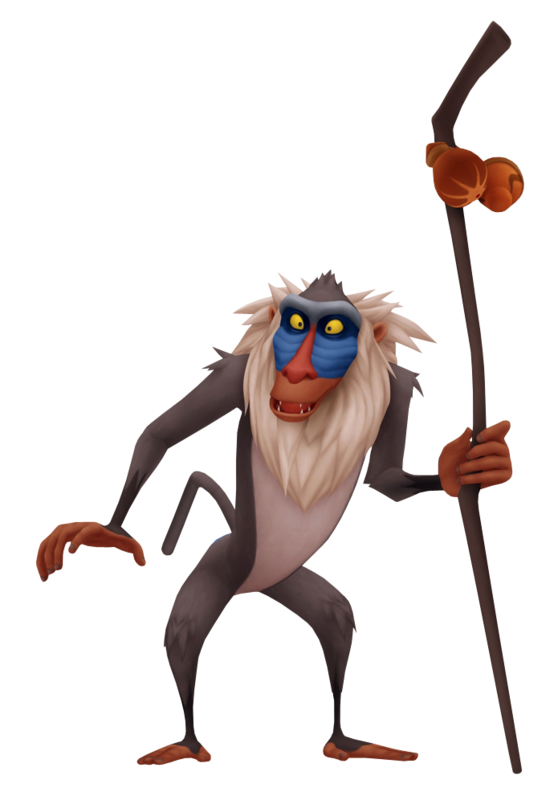 A mysterious mandrill serving as the trusted advisor of generations of Pride Land rulers, Rafiki has prophesized that whoever is able to overthrow Scar will be the next king, but has already deemed Sora, Donald and Goofy unworthy. Always watching for signs that the future king is still alive and well, he eventually learns of Simba's survival and points the party to the right direction of his current home. By the end of Scar's reign, Rafiki officiates Simba as king of Pride Rock. When manifestations of Scar begin appearing all over the land, Simba and company turns to Rafiki for advice, who reveals that these ‘ghosts' are feeding off Simba's insecure heart. He also tells Sora that the struggle between light and darkness will never end, for this is the great circle of life.